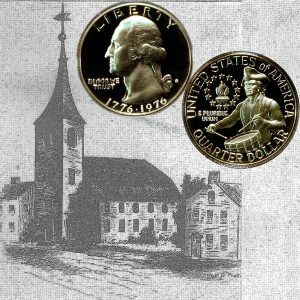 Today, the Bicentennial Quarter Coin remembers when General Howe ordered his men to take down the Old North Church for firewood on December 14, 1775. Several Boston churches became known as the Old North Church, this one, built in 1677, met its demise for want of firewood. The army in December* suffered much for want of the necessaries of life, food, clothing, and fuel. A few store-ships from England got in, but furnished but a small portion of the supplies that were needed and were expected. To add to the distress, the winter set in uncommonly severe. Before the barracks were ready on Bunker Hill, for the winter garrison, the troops encountered cutting winds and driving snows. General Clinton, with the remainder, moved into Boston. There are long descriptions of the sufferings of the troops and inhabitants at this period. Plundering, also, —if the numerous cases of discipline of this period be a fair criterion to judge from, —kept pace with the increase of suffering, and seemed almost to bid defiance to the efforts made to stop it. General Howe had every motive to check licentiousness, to respect private property, and to preserve order; and he dealt with merciless severity with cases of robbery by house-breaking. Some of the offenders were hung; some were sentenced to receive four hundred, some six hundred, some one thousand, lashes on the bare back with a cat-o’-nine-tails. The instances of discipline, while they confirm the contemporary relations of robbery and licentiousness, prove that they are unjust in ascribing them to the disposition or to the policy of the British commander. The want most easily supplied was that of fuel, and this was obtained by demolishing the poorest of the buildings. The “useless houses” in Charlestown—so an order terms the few that escaped the general conflagration—were the first that were authorized to be pulled down. They were divided into lots, and portions were assigned to each regiment. In Boston, so scanty was the supply dealt out, that the soldiers, notwithstanding severe prohibitions, demolished houses and fences, without waiting for orders. No supply having arrived, an order was issued (14th) authorizing working parties to take down the Old North Church and one hundred old wooden houses. Boston, at this period, presented its most deplorable aspect. Hostile cannon were planted on its hills and lawns, and an insolent soldiery sat around its hearth-stones, or used its buildings for fuel, or wantoned in its temples of worship. Its Faneuil Hall was a play-house, where the efforts of the sons of liberty were turned into ridicule. Its patriot population, exposed to the ill-treatment of the army and to the espionage of its adherents, in want of the necessaries of life, and cut off from relief which friends would gladly have extended, were obliged to endure the severest trials. The pursuits of commerce and of the mechanic arts, the freedom of the press, of speech and of public meetings, the courts, the churches and the schools, were all interrupted. Even the air was filled with unwelcome noise, as the morning and evening guns sounded from Beacon Hill, or as the relief guards marched with their music to perform their stated duties. In a word, Boston under rigid martial law was like a prison, and it is not that the inhabitants who sided with the patriots longed to leave a place so filled with hated sights and sounds, and to breathe, although in poverty and exile, the free air of the surrounding hills. ** The following is from the newspaper printed in Boston: —“Boston, December 14, 1775. Last Thursday a piratical brig, with ten carriage-guns and seventy-five men, fitted out at Plymouth, and commanded by one Martingale, was taken by the Foway man-of-war and brought in here. The prisoners we have are to be sent to England in the Tartar, which sails this day. Several other ships, likewise, sail this day for England, two of which carry the officers of the 18th and 59th regiments. “It is currently reported that the Continental Congress have declared the Colonies in a state of Independency. *** Watertown, Nov. 27. “On Friday last General Howe sent three hundred men, women, and children, poor of the town of Boston, over to Chelsea, without anything to subsist on, at this inclement season of the year, having, it is reported, only six cattle left in the town for Shubael Hewes, butcher master-general, to kill.”—Newspaper. The Bicentennial Quarter Coin shows with an image of the Old North Church that was built in 1677.